Thinking of moving to Australia? The attractions which Australia offers to its new arrivals are plentiful: from a warm climate which supports an active, outdoor lifestyle to low unemployment rates and four of the 10 top liveable cities in the world. Adding a landscape which encompasses rainforests, coral reefs, snowcapped mountains and which would take a lifetime to fully explore, and a friendly, easy going culture, there are few reasons not to move to Australia. Read on for more reasons to move to Oz. Moving to Australia is not a new concept. Waves of migrants, especially since World War II, have made the big east coast cities their new home, particularly moving to Melbourne (also known as the largest Greek city outside of Greece) and Sydney, becoming some of the most diverse in the world. The recent Chinese-led resources demand has seen Western Australia and Queensland boom and catch up with the more established states of NSW and Victoria. That boom has now slowed, but Australia’s golden beaches and laidback culture still draw migrants today. Australia’s cities are the most common destinations for immigrants – Sydney, Melbourne, Brisbane, Adelaide, and Perth all have growing populations, all consistently score very highly on global liveability surveys, and all have beaches. Despite huge success at accepting and integrating migrants, immigration has been something of a hot topic in Australian politics in recent years. As such, those moving to Australia will find it much easier to gain visas if they are sponsored by an Australian employer, are highly skilled, or have family ties to current citizens. Getting a visa to live and work in Australia can be difficult. There are exceptions though. New Zealand citizens, with minor exceptions, have to do nothing more than arrive at the airport to be granted an indefinite visa. If you are from the EU, the US, Canada, Argentina, Chile, and selected Asian countries including Hong Kong, Thailand, and Malaysia, and, aged between 18 and 31, the working holiday visa may be an option for you. Most migrants to Australia will come either as a sponsored migrant or on an independent skills visa. Migrants in these categories need to be generally under the age of 45 and to have skills that are in demand in Australia. Citizenship is fairly straightforward once you’ve been granted permanent residency. You can apply for citizenship once you have lived 4 years in Australia. Australian health care is some of the best in the world, having a mixed government and private funding model. If you are visiting Australia on a temporary work or student visa, you will not have access to Medicare, the government scheme which pays for essential medical services. You must have, as a condition of your visa, sufficient private medical insurance. If you gain permanent residency you then must enrol with Medicare. There are incentives to also take out private insurance to allow you more choice on private hospitals to cover extras such as dental and specialists which are not covered under Medicare. Before you move to Australia, an important thing is to find if your skills are in high demand in Oz. The main driver of the Australian economy is the mining industry. Although every state has mining at some level, the biggest mining sectors are in Western Australia and Queensland. Perth is the largest centre for workers on FIFO (fly-in-fly-out contracts in remote mines); while outback Queensland is the centre of a large coal and hardrock mining industry. When the mining sector is booming jobs for expats are readily available, particularly in Perth and Brisbane, but also in remote areas. Even if you don’t work directly in the mining sector, you’ll find work in other sectors that have lost trades particularly to mining (e.g. building, city services). Services are also a large employer in every main city in Australia. Canberra, the Federal capital has a majority of Federal public servant jobs (some of which require citizenship). Sydney has a strong financial services sector. Melbourne apart from being the centre of banking and financial services, also is the traditional home of mining head offices, although many are now based in Perth. If your English is poor, then it is difficult to get your first Australian job. Seasonal and remote work in the outback is also available and usually requires skills which involve physical stamina and attitude more than high-level English. Plus, you’ll learn a lot of Aussie slang! If you are multilingual, you will be able to find decent roles in virtually any sector, particularly health care and hospitality, when you move to Australia. Unusual fact : The biggest property in Australia is the size of Belgium. Property in Australia is all about location, location, location. Although the overall population density is very low, 85% of the population lives within 50km of the coast. House prices reflect this preference. Brisbane and particularly Perth have grown very quickly in the last 20-30 years. Beyond the central city these cities sprawl for miles as Australians generally prefer large, detached homes. Queensland’s Gold Coast has a distinct “American” feel to it, with many high rises and lots of townhouse developments. Prices in Queensland are generally cheaper than NSW and Victoria, but you can still spend millions if you want a penthouse with a coastal view. 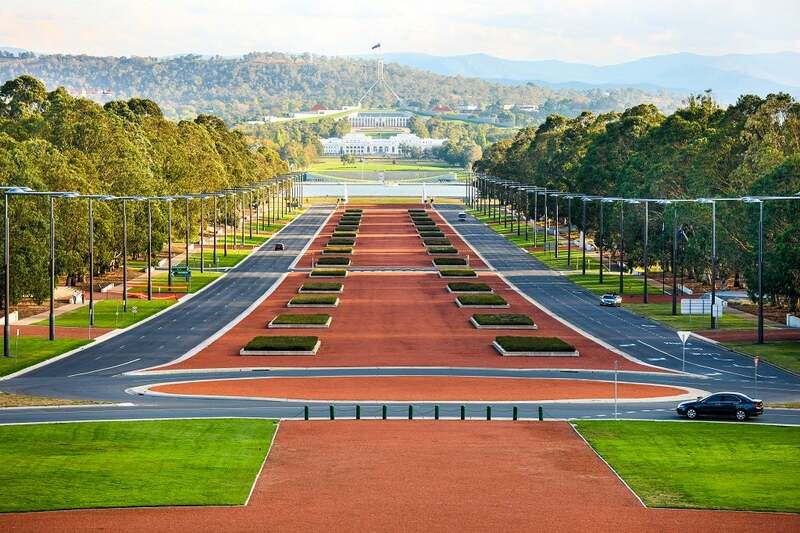 Canberra is a planned city, and even newer suburbs have an unusual (for Australia) uniform look. The city is known for its trees and cycle ways that sprawl for miles. In Australia, as elsewhere, the inner city tends to have the most renters, while families will buy cheaper property in more remote suburbs. Mortgages are generally affordable, but only because of the relatively high wages, and likelihood that both partners will be working. It’s much tougher for a single-income household to afford a house in the Australia’s large cities. Cheaper properties are available in Hobart, Darwin, and regional centres. The Australian government even offers grants to people buying a new home in the country for the first time. Shipping costs to Australia will vary widely depending on whether you are heading to the east or west coast, and of course, from where you are shipping. Below are indicative shipping costs for a 20 foot container. Costs vary little between the main east coast cities of Sydney, Brisbane, and Melbourne. Australia is pretty expensive compared to most other countries, but not unliveable. The combination of remoteness and a relatively small local market makes everything from petrol to groceries expensive. Away from the big cities costs, can be even higher, as the cost of many days in truck is often added to everything. Average rents in Sydney are only surpassed by Singapore, New York, and Hong Kong, at 2,313 AUD per month. Compared to Sydney, the cities of Brisbane (1,657 AUD), Perth (1,787 AUD) and Melbourne (1,651 AUD) are significantly cheaper. In contrast, a litre of petrol will cost you around £1 /litre in all major Australian cities. Although in the outback, fuel can triple in price. That other great indicator, the humble cappuccino will cost you around 4.81 AUD in remote Darwin, 4.50 AUD in Perth and around 4.20 AUD in the main east coast cities, except for Melbourne, Australia’s food capital, where they are a bargain at 3.81 AUD! In Australia the states control the education system, so curriculum and examinations vary dramatically. Primary school starts with a Kindergarten or Preparatory and runs through to year 6 or 7. Secondary school then covers up to year 10, while the last 2 years 11 and 12 are known as senior secondary school. Children start school aged 5 or 6. Australia has both state funded (known as public) and private schools (often associated with churches). If you are living in Australia on a temporary visa though be careful because some states may charge substantial fees for dependent children on temporary visas. Popular fields of study for international students in Australia include Engineering, Sciences, Business, and Technology. Australia has one of the highest costs of living in the world, only beaten by Switzerland and some of the Scandinavian countries. The average cost of living is similar to New York City and London by some surveys. Fortunately, Australian’s disposable income (after taxes) of is higher than most, including the US, UK, and Germany. We hear so much about the laid-back happy Australian stereotype that it may come as a surprise to find that the Happy Planet Index ranked Australia 75th firmly out of the running for the happiest country (Costa Rica was #1), outranked even by rivals New Zealand (#28) and the UK (#41). However, neither of those countries had four cities ranking in the top 10 most liveable cities list of 2015; Australia did! Australia’s economy is very dependent of digging up and shipping out mineral resources tends to rank poorly on environmental impact. If you’re moving to Australia, you should know that four of its cities are part of the top 10 most liveable cities in the world. Four. Not shabby for a country that was founded by colonial prisoners. Four of its universities made the top 100 universities in the world – hey, not every institution can be Harvard – and the country was ranked 32nd by WHO for its healthcare system – above the likes of Denmark, the US and New Zealand. If you know nothing about Australia, you should at least know about the amazing natural wonder just off its coast, the Great Barrier Reef, and the unique wildlife found across the continent. More interested in vineyards than the Outback? Australia is the fourth largest exporter of wine in the world. Rules vary by state, but in general if you hold a temporary visa you can continue to drive on your overseas licence for as long as it’s valid. If you have a permanent visas you have 3 months (6 months in Victoria) to get a local licence. This is normally a simple matter of paying the relevant fee, passing the eyesight test and providing your documentation. Unless you are a learner or new driver you are not required to resit a driving test. Perth has the largest percentage of recent migrants, with over 30% of its population of 2 million born outside of Australia. The largest proportion, at 10%, is Brits, followed by New Zealanders, and South Africans. Sydney and Melbourne are also both popular destinations for recent migrants with strong expat communities.